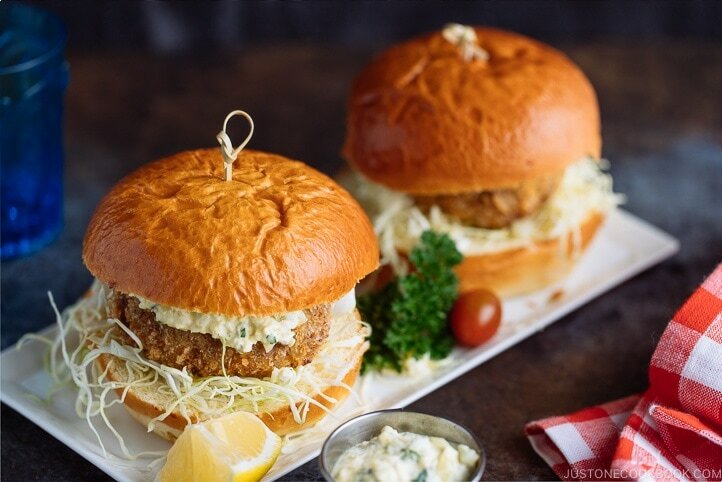 Do you agree that anything fried and crispy can easily be transformed into a good, hearty sandwich" Take examples, Korokke, ebi katsu, chicken katsu, tonkatsu and ham katsu. All these deep-fried goodness are hard to beat when they are tucked into bread. So does menchi katsu – the crunchy panko-breaded, juicy meat cutlet that I’ve just shared last week. You could have it with steamed rice and a side of soup, or in a sandwich form like today’s recipe for a fuss-free preparation. In Japan, menchi katsu sandwich often uses pillowy soft white bread called the shokupan. Slightly buttery with a subtly sweet milk taste, these Japanese sandwich bread, when paired with the crunchy cutlet, they make some killer sandwich. But shokupan can be hard to find unless your local Asian bakery shop sells them. Since I am a huge fan of brioche buns, I’ve opted the soft and fluffy French-style buns for my menchi katsu sandwich.